Favorite Line: Mrs. Allardyce was built like a blacksmith, but without the daintiness. Phil Beaumont is a Pinkerton detective assigned to the magician Harry Houdini to keep him safe from a rival magician known as Chin Soo. Houdini and Beaumont go to a house party hosted by Lord and Lady Purleigh at their country home in Devon, where they've invited an eclectic assortment of relations, Austrian psychoanalysts, friends and the illustrious author Sir Arthur Conan Doyle. A lady's companion, the bright and sassy Miss Jane Turner, is advanced upon in her bedroom by a lewd old ghosts. Two other ghosts are seen under a willow tree. A poacher shoots at a group of people, small items are misplaced, a boxing match is scheduled for dawn and Lord Purleigh's father is found dead by bullet wound in a locked room. Who did it? And why? And how? And whatever happened to Chin Soo? This book was an absolute delight to read. I looked for some time for a blog reviewing it, but couldn't find one. This is vastly unfortunate because I hope more people read this book. It takes place between the two world wars and you can almost see the characters in film noir- all the bombshell women with their long while gloves and cigarette holders, all the men with their suits and their deadpan sense of sarcastic humor. The characters are all so well-written! Each one has his or her own voice and personality. While I really liked both Jane Turner and Phil Beaumont, I think Cecily Fitzwilliam (Lord Purleigh's daughter) had the best lines. (Example: "I am not a nymphomaniac!") 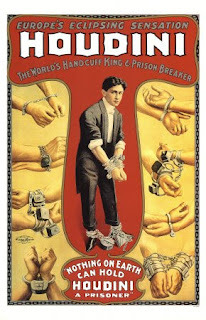 But Harry Houdini steals the show. He is so cocky, so utterly sure of himself and his self-worth. I don't know if that is what Houdini really was like in personality, but now I will never see him in any other way. This is very much a traditional English country home murder, where there are a certain number of people at a house party when a murder is committed, so the suspects are limited. It also includes all the fun class system divides that are vital to that genre, and all the bedroom-hopping and misconceptions that can occur between people. The mystery is engaging (though, for me, the ending was quite a surprise), but it never bogs down the fun aspects of the story. The conversations are always light and entertaining; both Beaumont & Turner's internal dialogues and the conversations that occur between people in the story. Satterthwait's humor reminded me of Terry Pratchett's in some ways, and also of Georgette Heyer's. Spot on. 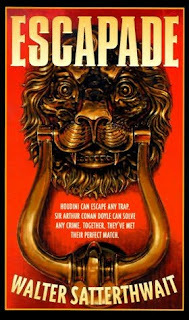 I expected Sir Arthur Conan Doyle to be more present in the story than he was, but I suppose with two such huge personalities as Houdini and Doyle in the same place, one must take precedence. And as I adored Harry Houdini in this book, I'm very content with Satterthwait's decision to make it the magician. This book has been sitting on my shelf for years. I don't even remember who first recommended it to me, but when I read The King's English earlier this year, the author mentioned Satterthwait and it jogged my memory that I had one of his books. So I picked it up on my last perusal of the shelves, and I'm so glad I did! It wasn't an overly deep or complicated book. It was fun and entertaining and I wish I could share more quotes with you, but I don't know how to share just one line of entire conversations that had me in giggles. I am so thrilled that there are two sequels to Escapade, called Masquerade and Cavalcade. I ordered Masquerade for myself last night, and I thoroughly look forward to the ongoing adventures of Beaumont & Turner. So glad I discovered Satterthwait, and if anyone has read anything else by him that they recommend, please let me know. His books are now on my list of ones to grab if seen in a used bookstore. Updated: I can't believe I forgot to mention the hilarious Scotland Yard inspector who quotes obscure (well, obscure to me) Shakespeare passages in completely awkward and incorrect contexts. He wasn't in the book as long as Houdini was, but he had an absolutely fantastic cameo appearance. I'm trying to imagine a dainty blacksmith...and failing! A beautifully written review and the book has everything I love about literature I also love the cover. Thank you for sharing and you have a brilliant weekend. Sounds great. I'm off to add it to my wishlist. By the way, I loved The Prestige too and wished I had read it before I saw the movie. Mark- Yes, you've mentioned The Prestige before. Will put it on my wish list for sure! I enjoyed the movie, but books are usually better. Romantic Query Letter- Yes, the cover is quite evocative, isn't it? I like it, too. Carol- Yay! I hope to get the next book, Masquerade, soon. Though not sure when I'll actually read it, considering how long it took me to review this one. Hopefully sooner rather than later. What an AWESOME opening sentence! :D Your review made me want to run out and get this right away, hehe. I'm always attracted to magicians in fiction! Fantastic review. I've never come across Walter Satterthwait before but I'm going to be on a lookout for this book. I love country house murders and especially ones with such interesting characters. You have made this book sound so appealiing. I just have to look it up now and find out more about it. Oooh, this sounds really awesome. I'll definitely be putting this on my wishlist! Thanks for the review. Eva- I agree, magicians in fiction are so fun! Though Houdini doesn't do much magic (besides amazingly opening doors and handcuffs), he is QUITE the character. Blodeuedd- I am glad I updated the post to talk about him, then! He's really fun. Chasing Bawa- It's strange how so many people haven't come across Satterthwait's Pinkerton series, though I think his contemporary mysteries set in the Southwest USA have more of a following. Vivienne- Let me know what you think, after your research! Bookshelf Monstrosity- I always love when I read books that have been sitting on my shelf for a very long time. To completely exaggerate, it makes me feel like Columbus "discovering" the New World. Lana- Glad you enjoyed it, and I hope you read it! Sometimes I find myself slightly uncomfortable with the fictionalization of real-life people, but this sounds soooo good. I will give it a try. That blacksmith line is hilarious! Just reading that, I knew, even without reading further, that this is a book I'd like to read. The rest of your review confirmed this! It's going on my list right now. Oh, this does sound very good, and funny, which I am in serious need of right now! Ok, so this one definitely goes on the list. It sounds like you really enjoyed yourself with this book and I'll just bet I will too! Great review! What a fantastic idea, this 'riverters' thing. Really nice! This sounds great! I've never heard of it, but I'll keep an eye out for it.